Rock band Do Not Forsake Me Oh My Darling just issued their Questions Are A Burden To Others EP, and like all the duo’s work, these six songs were inspired by original 1960s version of The Prisoner. 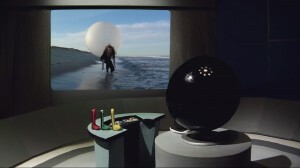 Premiered on magnetmagazine.com, the track “Episode 1: Arrival, sees drummer/vocalist Sophia Cacciola and bassist Michael J. Epstein in a shot-for-shot recreation of The Prisoner’s opening sequence. “This project took 11 days of shooting and nearly two years of planning to create,” Sophia told SciFiPulse. “It was shot all over Boston and New England with an eye to replicate as nearly as we could the London/Wales/1960s landscape of the original. protagonist unfolds as she angrily resigns from her intelligence position only to find that she can’t get away quickly enough to avoid being gassed and chased by a giant white ball. “Our band is two thirds of the way through a project to write and record a song for each of the 17 episodes of The Prisoner,” Sophia explains. “Our second EP – Questions Are a Burden to Others was released this week. Our first EP, The New Number 2, includes the song from the video ‘Episode 1 – Arrival’”. Follow us on Twitter @SciFiPulse. © 2009 SciFiPulse.Net by ZTHEME. Powered by WordPress.